Taking a break from my posts on China, I am summarising a fantastic article by Mr. Nick Robinson (Yale Law School South Asia Teaching and Research Fellow and a visiting fellow at the Centre for Policy Research, New Delhi) which appeared recently in Frontline magazine. The article argues that the Supreme Court is not as populist as it is made out to be, and access to it is actually getting more and more difficult by the day. It also provides hard statistics on how the Supreme Court is accessible mostly to those with money and resources. Assertion One: Efforts to make the SC more accessible to the poor and people living in distant parts of the country have failed. This can be seen by studying what percentage of cases are admitted to the SC on appeal from various High Courts. 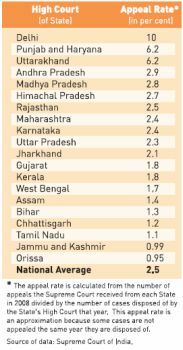 “While on an average, nationally, there was about a 2.5 per cent chance in 2008 that a case will be appealed from a High Court to the Supreme Court, in States close to Delhi, such as Punjab, Haryana and Uttarakhand, the appeal rates were more than double this. In Delhi itself the appeal rate was 10 per cent…”. In Tamil Nadu, the rate was around 1%. Assertion Two: Access to the SC is very costly, and affects what types of cases the SC hears. The number of Writ petitions (where people directly approach the SC to protect their fundamental rights) was a mere 2% of matters listed for Admission (The SC allots specific days, usually Mondays and Fridays to decide which matters will be heard in detail by it. Lawyers present arguments to justify why the Court must hear the matter in detail, and not throw it out). Out of this 2%, guess how many were admitted. According to Mr. Robinson, none!! Compared to this, in the 1970s, cases about fundamental rights were about 10% of all cases admitted in the SC. Assertion Three: The SC has ruled increasingly against the disadvantaged. The author points to research made by an economist and a legal scholar that of cases relating to fundamental rights and public interest litigation heard over the past 30 years finds the SC has ruled increasingly against the socially disadvantaged. During the same period, more privileged litigants have become more successful in such cases. Assertion Four: Constitutional benches, where significant matters of constitutional law are heard, now make up fewer than 1 per cent of the court’s regular hearing decisions. Assertion Five: The media may have over-emphasized the problem of backlogs in the SC and other courts, and ignored other problems. A court’s ability to clear pending cases does not say anything about the quality of those judgements. It also does not show whether the court should have agreed to hear the matters in the first place. The article then goes on to talk about much-needed reforms in the judiciary, including those proposed by the judiciary and the law Ministry. The article is important, if only because it gives some hard data on problems people working directly, or affected by such problems can relate to, but never state with much authority. Thanks for the thumbs up! !